My favorite places to eat on the entire planet are generally small, hole-in-the-wall, privately owned, mom & pop places, that generally have an ethnic twist. I enjoy places where you can actually taste the love that went into making the food by hand, and where they make you feel like you are at home. I respect owners that are always ready to greet me, and know me by name, even though, I’m nobody special…just a hungry guy usually in cargo shorts, flip-flops and an AC/DC t-shirt. I discovered this place a couple of years ago. It sits in a small strip center just North of Clark Road on Swift in Sarasota. It is one of those places that I’d driven past 100 times, and each time, told myself, “I gotta check that place out.” Finally, one day, for whatever the reason, I stopped, and I’ve been hooked ever since. So what exactly is this delicacy that I hold in such high regard. The Free Dictionary defines it in the following way: pas·ty (păs′tē), n. pl. pas·ties Chiefly British, A pie or turnover, especially one filled with seasoned meat or fish. Probably the most classic is the Cornish Pasty, which is stuffed with beef, potato, swede (rutabaga or turnip), onion, and seasoned with salt and pepper. Although there are several variations of the crust, it is baked, and must not crack during the cooking or the cooling process, and must retain the shape of the letter capital D.
The menu isn’t huge, but I’ve literally tried everything on it, and everything has been a home run, although, if I had to pick a favorite, it would have to be the Cheese and Onion. When I’m feeling particularly naughty, I’ll also indulge in a Banger, or Lamb Bombay wrapped in pastry. The Original Cornish and Shepherd’s Pie are fantastic choices as well. Pasties have a long, and rich history. Nobody really knows exactly how old they are, or where they came from, but they have been documented as early as the 1270’s and the first recipes appear in a French cookbook from the 1300’s. Throughout history, pasties have been held in regard from everything to a gourmet meal, to what today, would be considered a street food. In the 17 and 1800’s Cornish tin miners would take pasties into the mines for their lunch. Due to the dense nature of the food, it would stay warm for several hours. If the meal got cold, minors would place the pasty on a shovel, and heat it over a candle. Migrating minors looking for better lives have introduced the pasty to many parts of the globe, including The Upper P of Michigan, Pennsylvania and my home state of Colorado. 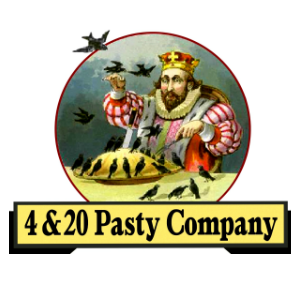 Formerly from London, Richard and Barbara Posner opened 4 & 20 Pasty Company in 2003. It is a quaint store, and addition to the wonderful pasties, they also carry specialty items from the United Kingdom that can be difficult to find. Please check them out, and let me know what you think!